A personal tragedy inspired Tricia Trimble, who lost her mother to skin cancer and managed to turn her pain into purpose. After her mother’s death, Tricia became a strong advocate for wearing sunscreen, but she was troubled by the use of chemical UV blockers and other unsavory ingredients. After several years of education and research, Tricia developed her own mineral-based sunscreen line in memory of her mother and others who’ve lost their lives to skin cancer. 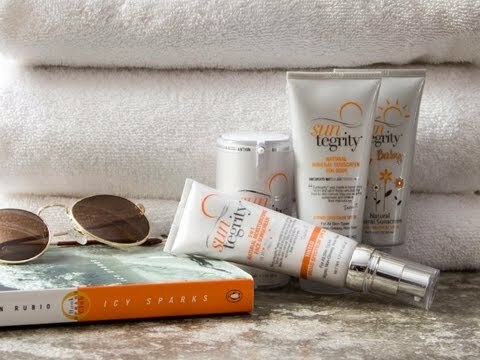 The Suntegrity line includes topical sunscreens for the face and body, along with Sun Defense, a dietary supplement that’s designed to help the body fight sun damage. Tricia’s face and body products use uncoated zinc oxide to provide UVA/UVB protection; antioxidants and amino acids to promote skin repair; and nontoxic preservatives to stay fresh. Everything is vegan, cruelty-free, and made in the U.S. You’ll find ingredients such as organic aloe vera, red algae, sunflower, pomegranate, cucumber, and green tea. What you won’t find? There are no parabens, phthalates, propylene glycol, mineral oils, synthetic dyes, sulfates, titanium dioxide, nanoparticles, or chemical UV absorbers. 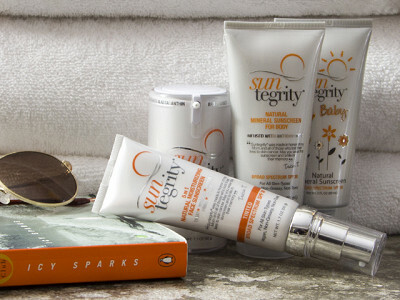 Suntegrity’s topical sunscreens deliver superior coverage, yet they feel light and won’t clog your pores. They’re versatile, too. Tricia’s 3-in-1 face moisturizer, sunscreen and makeup primer, for example, gives you the protection you need while also speeding up your morning routine. With her natural, healthy approach to sun care, Tricia makes it easy to adopt good habits. Her heartfelt message of hope seals the deal. Greetings Daily Grommet followers! I'm so excited to introduce you to Suntegrity, a beautiful line of safe, healthy & holistic sun care products I created in memory of my Mom who passed away from skin cancer. Creating it was my way of honoring her and carrying on her legacy. It's my way of making lemonade out of lemons. The intention behind Suntegrity is to spread love in the world one sunscreen dollop at a time while protecting you from sun damage and inspiring you to live your heart's desire! First, Thank you! It's been frustrating trying to decide which is worse, no sun protection or carcinogens on my skin. I don't wear make-up so I was wondering if I could possibly use the body sunscreen on my face? I can't help but notice that the first ingredient in the face moisturizer is water, which is the last in the body one. Couldn't I just add a bit of water and use on my face? With the same thought in mind, could a mother use the baby sunscreen? I understand it costs more for a small company to make products, especially high quality ones, but I still have a limited budget. These are good questions and we hear you on the limited budget. Tricia will be along shortly to address your questions about the body lotion etc. Yes, you can use the body or baby sunscreen on your face for sun protection. The face sunscreen contain more antioxidants for anti-aging purposes than the body or baby does and the "5 in 1" sunscreen contains a tint so it can replace your foundation. Are there parabens in these products? No, our products do NOT contain any parabens (synthetic or natural). I watched your wonderful Daily Grommet video, thank you for sharing. Thank you for your comment! You have a few options – if you prefer no color, you can try the regular face sunscreen & primer which starts out white so you can see where you applied it (and not miss a spot) and then as you rub it in, the white will disappear. However, we find that many men actually prefer the “5 in 1” tinted face sunscreens because they leave the skin with a sun-kissed glow/slightly tanned look. If you have light olive skin, then I would recommend the light tint and if you have medium colored olive skin, I would recommend the medium tint. The face sunscreens serve a multitude of functions beyond just sunscreen– they contain several antioxidants to treat and moisturize the skin. Secondly, in reference to Susan's comment, why is water listed first in the Natural Moisturizer and the 5 in 1 Moisturizer. That means it is the main ingredient and I wonder if it makes it less effective as a sunscreen than the body & baby products? I did like the response on the 5 in 1 product that it leaves the skin with a sun-kissed glow, etc., which would mean less make-up, foundation, etc. on the skin. Thanks. BB stands for Beauty Balm which is equivalent to a multi-taking face product with sunscreen and is the same thing as our “5 in1” Tinted Face Sunscreens . At the time we launched this product, nobody knew what a BB Cream was so we named it a “5 in 1” instead of a BB Cream, but they are the same thing. 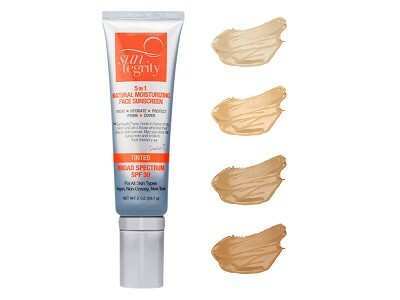 Here’s a great article by a well known dermatologist about them…http://www.drbaileyskincare.com/blog/what-is-a-bb-cream/ As for Susan’s comment, all of our sunscreens are equally effective as a Broad Spectrum SPF 30 sunscreen as they contain 20% Zinc Oxide which is listed under the Active Ingredients section, not the Inactive Ingredients section. The Inactive Ingredients of the Body and Baby sunscreens are listed in alphabetical order because they are marketed solely as sunscreens (not as cosmetics & sunscreens) and by the new FDA regulations, Inactive Ingredients are to be listed in alphabetical order for products marketed solely as sunscreens. Thanks so much for your timely and knoweldgeabely reply! I have googled 'BB' cream and never gotten any more info on it's description than more BB products! Also, I am glad to know that the sunscreen aspect of the 5 in 1 product is as effective as the Body and Baby products. 'sun kissed' glow, I am going to order the light version. I also really like the fact that along with the sunscreen, moisturizor, etc. that there will be less to apply to my face in the morning and still look covered and natural. Do you have a need to re-apply this every so many hours? Example, at the amusement park all day on and off water rides in 80+ Florida weather? I like sunscreens with a little longevity. This is a great question Melissa and I'm sure others will be wondering. We'd typically suggest that it's always a good idea to re-apply, however I've contacted Tricia to find out for sure. Myself or Tricia will be posting the answer here soon. Typically mineral sunscreen will last longer on the skin than chemical sunscreen, however, the FDA requires all sunscreen companies to include in the Directions for use in the Drug Facts box the following statement - "Reapply at least every 2 hours." They also recommend that you reapply after swimming or sweating the sunscreen off. A personal tragedy inspired Tricia Trimble, who lost her mother to skin cancer and managed to turn her pain into purpose. After her mother’s death, Tricia became a strong advocate for wearing sunscreen, but she was troubled by the use of chemical UV blockers and other unsavory ingredients. After several years of education and research, Tricia developed her own mineral-based sunscreen line in memory of her mother and others who’ve lost their lives to skin cancer. 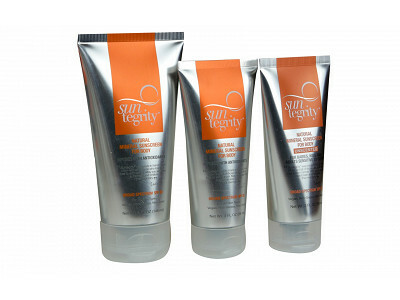 The Suntegrity line includes topical sunscreens for the face and body, along with Sun Defense, a dietary supplement that’s designed to help the body fight sun damage. Tricia’s face and body products use uncoated zinc oxide to provide UVA/UVB protection; antioxidants and amino acids to promote skin repair; and nontoxic preservatives to stay fresh. Everything is vegan, cruelty-free, and made in the U.S. You’ll find ingredients such as organic aloe vera, red algae, sunflower, pomegranate, cucumber, and green tea. What you won’t find? There are no parabens, phthalates, propylene glycol, mineral oils, synthetic dyes, sulfates, titanium dioxide, nanoparticles, or chemical UV absorbers. 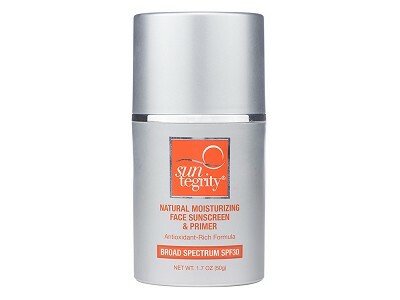 Suntegrity’s topical sunscreens deliver superior coverage, yet they feel light and won’t clog your pores. They’re versatile, too. Tricia’s 3-in-1 face moisturizer, sunscreen and makeup primer, for example, gives you the protection you need while also speeding up your morning routine.